Tue., March 7, 2017, 10:04 p.m.
DALLAS – Dirk Nowitzki scored the 20 points he needed for 30,000 in his career in barely more than a quarter, and the Dallas Mavericks celebrated with their second straight easy home win over the Los Angeles Lakers, a 122-111 victory Tuesday night. The 7-foot German became the sixth NBA player and the first international one to reach the milestone, joining four Hall of Famers and a future one in Kobe Bryant. 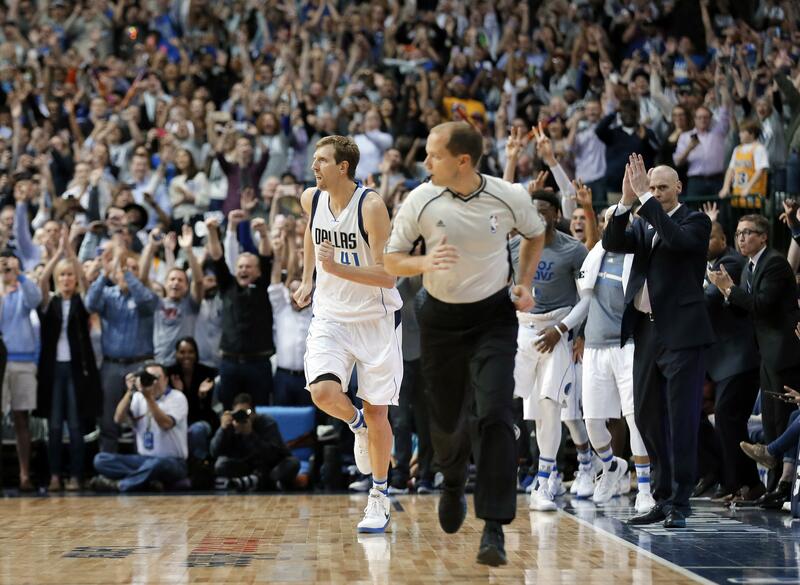 Nowitzki is one of three to score all 30,000-plus with one team. The others are Karl Malone (Utah) and Bryant (Lakers). The 38-year-old Nowitzki matched the best first quarter in his 19 seasons by scoring 18 points, and reached the hallowed mark on a 15-foot fadeaway jumper from the baseline over Larry Nance Jr. with 10:58 remaining in the second quarter. Nowitzki scored all of his 25 points – one shy of his season high – in the first half to send the Mavericks to a 31-point lead in the third quarter. This was the Lakers’ first visit to Dallas since setting a franchise record with a 49-point loss, a 122-73 blowout on Jan. 22. Dallas extended a franchise record with its 14th straight win over the Lakers, who got a triple-double from Julius Randle with 13 points, 18 rebounds and 10 assists in their eighth straight loss. OKLAHOMA CITY – Portland overcame Russell Westbrook’s career-high 58 points to beat Oklahoma City. Allen Crabbe scored 23 points, Damian Lillard had 22 and C.J. McCollum 21 for the Trail Blazers, who won their third straight. Portland shot 55 percent from the field. Westbrook shot 21 of 39, but just 6 of 15 in the fourth quarter. Westbrook entered the game as the league leader in points and plus/minus score in the last five minutes of regulation and overtime. Westbrook also finished the game with nine assists and made 13 of 16 free throws. Victor Oladipo scored 16 points and Enes Kanter added 11 for Oklahoma City, which dropped its fourth straight. Oklahoma City lost despite shooting 52 percent. PHOENIX – Bojan Bogdanovic scored 29 points, setting a franchise record for free throws made by going 16 of 16, and Washington opened a five-game western trip with a victory over pesky Phoenix. Bradley Beal had 27 points and John Wall added 25 points and 14 assists in a victory that ended the Suns’ three-game winning streak, their longest since November 2015. Eric Bledsoe scored 30 points for the Suns, who erased a 22-point, first-half deficit, were tied at 110 with 5:16 to play and challenged the Wizards in the final two minutes before Wall finally clinched it with two free throws with 6.5 seconds to play. Devin Booker scored 25 for the Suns, nine in the final 21 seconds. Published: March 7, 2017, 10:04 p.m.